I used a brayer and raspberry and red pepper adirondacks ink pads for the background. 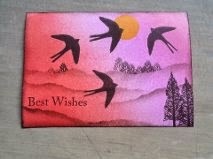 I stamped the swallows from the Clarity Journalling set. I used a mask to cover the top swallow and created the sun. the hills were made using torn paper and an espresso adirondack inkpad. The trees are from the Clarity 'Trees and their mantles' set.